Wet screed offers both reliable performance and operator comfort. With a variety of blade lengths the unit is designed to fit the demands of every operator. Its unique twin handle system is fully height and angle adjustable offering maximum operator comfort. In addition, two isolators reduce handle vibration to the operator. Squeeze-grip handle is also foldable for easy transport and storage. 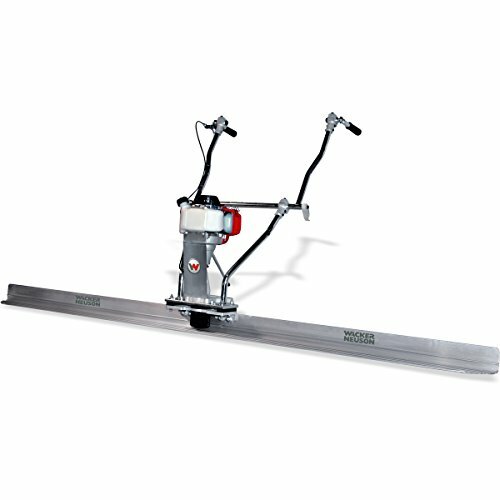 A high production unit for quick and accurate strike-off of concrete slabs with or without the support of grade stakes and forms for residential, light commercial, industrial and highway applications. Twin handle system is fully height and angle adjustable to for operator comfort, Shock mounted to reduce vibration to the operator. Length x width x height: 44 x 21.5 x 37in, Beam width: 4.9in, Weight: 34lb, Engine Type:air-cooled, 4 cycle, single cylinder, gas engine, Operating speed:Variable 1/min, Piston displacement: 1.9in3, Horsepower: 1.5hp, Fuel tank capacity: 0.64 US qt, Fuel consumption: 0.53US qt/h.